Experts tell us the first step in becoming an environmentalist is noticing what nature offers. Such observation often leads to a desire and commitment to conserve and protect the natural world. Walking or hiking through the woods is a regular part of camp. However, many times staff and campers merely walk along the trail without really noticing what is around them. They overlook the sounds, sights, textures and diversity of the ecosystem. There are several interesting activities that can be done while walking through the woodlands. Simple supplies are needed, so it will take only a few minutes to collect them. Or you can prepare a Woodland Walk Kit ahead of time for supplies, and index cards with directions for the activities. Ahead of time: Draw a circle, square, triangle, heart, straight line and rectangle on separate cards. Pass out the cards to campers before hike begins. Assignment: Look at the shape on the card and find it in nature. Invite other members of the group to look at what you find. Write down your findings on the card with the corresponding shape. Conversation: What did you see that you never noticed before? Ahead of time: Pass out the color strips to campers. You can have them work in pairs to use one color strip. Assignment: Look for colors in nature that match the color strip. Keep a record of what you find. You can collect any samples on the ground, but if the color is on a living plant, you can pick it only if there are six remaining after you have done so. Conversation: What surprised you most? What’s your favorite color in nature? Ahead of time: Find out from the camp director or nature director what types of wildflowers are in bloom and where to find them. Assignment: Stop at any wildflower, observe it, and try to figure out how it grows, how it produces seeds, and what type of soil it grows in. 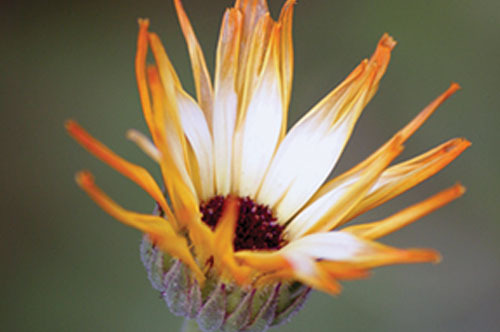 Use the field guide to identify the flower. You can pick one if there are at least six blooms left. Conversation: How are the flowers alike? How are they different? Ahead of time: Try your hand at this before the hike, so you can help campers if needed. Assignment: Search for trees, rocks and logs that have a variety of textures. Put the paper over the surface of the tree, rock or log, hold the charcoal or crayon at an angle, and rub over the paper so that the unique pattern is transferred to the paper. Conversation: What did you discover by doing these rubbings? Ahead of time: Find out what types of birds are native to the woods around camp. Assignment: Find a place to sit in the woods a slight distance from others, and be as quiet as possible. Close your eyes and listen. When you hear a sound, put a mark on the paper showing what direction the sound comes from. Then see if you can find the source of the sound. If you see a bird making the sound, use the field guide to determine what it is. Conversation: What was your favorite sound and why? Ahead of time: Cut the yarn into 15-inch pieces, one for every two campers. Assignment: Move off the trail, and make a square or circle on the ground with the yarn. Study what you find within the square or circle. What lives there? What is the soil like? What grows there? Use a stick and dig into the ground a little. What do you see? Conversation: What did you find in the square or circle that surprised you? Ahead of time: Do your own thinking about how the ecosystem would be impacted by the development of the land. Assignment: Stop along the trail and look into the woods. Imagine that the camp sold this plot of land to a developer to build cabins. How would that development change the woods? What effect would it have on the habitat and food supplies of the animals living there? What would happen to the soil if the trees were cut down? How would the plants in the woods change? How would the threat of erosion increase? Conversation: How have ecosystems near your home been destroyed? What changes have happened to the land? Ahead of time: Identify a place on the trail where there is a variety of trees. Assignment: Find a partner and decide who will be blindfolded first. The sighted partner will lead his/her partner to a tree. The blindfolded camper will explore the tree by touch and smell. Then the sighted partner leads his/her partner away from the tree. Once the blindfold is removed, that camper tries to locate the tree. Switch places and repeat. Conversation: What have you learned about trees that you didn’t know before? Ahead of time: Be sure you know where you can find some rotten logs. Assignment: Find a downed tree in the woods. Examine what is growing on the log, such as moss or mushrooms. Look for any insects living in or on the log. Shine the flashlight inside the log. Is there evidence of any creatures, such as raccoons, opossum or snakes inside? Examine the bark to see what is happening to it. Turn the log over to see what is happening underneath. How is the forest recycling itself? Use the magnifying glass to look closely at anything that interests you. Conversation: What additional changes would you see next summer? Ahead of time: Brush up on what you learned about seeds in science classes. Assignment: Look for plants with seeds--they may be on the ground, in trees or on fellow plants. Collect a few seeds of each kind, and put them in separate envelopes. Look in the field guide to identify the plant that made the seed. Notice all the different shapes and sizes of the seeds, and think about how they travel. Conversation: What would happen if someone collected all the seeds and destroyed them? Nancy Ferguson is an Outdoor Ministries consultant, specializing in the creation of program resources for faith-based camps. She is the author of several books, including Training Staff to be Spiritual Leaders. She can be reached via e-mail at nanfergi@aol.com.